Stop in for our diner breakfasts! 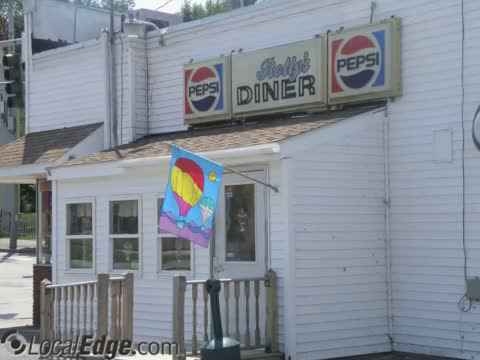 Rolly's Diner is located across from Lewiston, ME at 87 Mill Street in Auburn, ME. Inside this fairly nondescript building lies some of the best comfort food you have ever had anywhere. If you're looking for diner breakfast you've come to the right place. Whether you're looking for the greatest blueberry pancakes you've ever had or fluffy omelets. You won't find any better east or west of the Mississippi river. Check out their restaurant menu also for great lunch ideas. Rolly's also has a fantastic catering service featuring the best in sculptured fruit. Good cooking and plenty of it! At Rolly's Diner, we specialize in dishes loaded with the freshest ingredients and plates heaped high for real appetites. Order breakfast, lunch or dinner with your eyes shut — you simply cannot go wrong. The menu includes classic American favorites. All of our food is prepared with high quality ingredients and attention to detail. Rolly's is not your average diner. The menu is jam packed with classic favorites and twists on original creations that have our customers coming back time and time again. Classic diner breakfasts are always a big hit with our customers. If you're looking for authentic cooking and an extensive menu to choose from, Rolly's Diner is the place to go. In Lewiston, ME, you have many options when you're looking for a place to eat. For that family friendly diner atmosphere, Rolly's Diner is the place to be. We are a staple in Lewiston and are known for our outstanding diner breakfasts. The best diner breakfast in the Lewiston, ME area! Can't get enough of our food and diner breakfasts? We also offer the option for catering services. Let us cater your next function, birthday party, or office lunch. We bring all the delicious food you love from Rolly's Diner right to you. No more worrying about what to cook or how much to prepare. Let us worry about the food. Your guests will love the unique catering services offered from Rolly's. Don't forget to hire Rolly's Diner for your next catering service. Rolly's Diner has long been known for its American comfort food in Lewiston, ME. Today, it remains true to tradition while offering more diner breakfast choices than ever before on its extensive menu. Choose from our selections of diner breakfast items such as soups, salads, sandwiches, hamburgers, and much more! We have mastered the art of casual dining, serving each customer with generous portions at a reasonable price and a comfortable, family-friendly atmosphere that keeps them coming back year after year. An authentic diner breakfast is becoming harder and harder to find. A hearty meal is something that's second nature to Rolly's Diner of Lewiston. Join us for a weekend diner breakfast with the whole family in order to get your day started right. Come join us and experience a local diner that has consistently satisfied the appetites of generations of locals and dedicated out of town visitors. See for yourself what our loyal customers have been talking about: warm and genuine hospitality, healthy family meal choices, great food and value, good times and lasting friendships. Our success as a company is based on the skills and efforts of our employees. As part of our commitment to you as a valued customer, we guarantee friendly, professional service with a smile. By providing generous portions of our classic home style fare, we ensure the old fashioned value that diners are famous for. If you are one of the many customers that have fallen in love with the cuisine here at Rolly's, consider our catering services for your next get together. Rolly's is perfect for weddings, graduation parties, office lunches, and everything in between. Our catering menu is extensive and has all of our guest favorites. To learn more about catering with Rolly's Diner, please give us a call today. We would be happy to cater any size event. In addition to serving breakfast, lunch, and dinner, we also offer catering services. Whether you are hosting a party for family and friends or you need catering for a corporate event that you are planning, we have you covered. Our delicious food will certainly make your party the talk of the town. We serve customers in Lewiston, ME and the surrounding areas. If you are ready to start planning the menu for the big day, contact us today for catering services. For graduations, birthday parties, family reunions, and social events, Rolly's Diner is a convenient option for catering services. Your guests will love our food and you'll save time without planning the party menu! If you have an event around the corner, consider Rolly's Diner for your event catering services. Our catering menu is extensive. It is filled with all of our guest favorites as well as many of our unique creations. Our catering services are very professional and will fit any atmosphere from birthday parties to weddings. Let our catering staff impress you today. Our restaurant menu is loaded with a ton of classic favorites that will satisfy everyone in your party. From picky children to adventurous adults, there's always something to please everyone. We keep our restaurant menu updated often so you can frequently find new items to try. If you visit Rolly's Diner all the time or once in a while, you'll still be impressed by their extensive restaurant menu. If you're looking for a traditional menu or something special, Rolly's Diner is right for any night out. Let us impress you for even special occasions. Take a look through our menu and you'll see all of the wonderful creations that our proud patrons have fallen in love with. Join us at Rolly's Diner and taste the difference. Rolly's Diner has an extensive restaurant menu that will satisfy even the pickiest of eaters. We know everyone will be able to find something they love here at Rolly's. From our dinner specials to our famous diner breakfasts, come in to Rolly's for an outstanding meal! When people talk about Rolly's Diner, they're usually talking about the fantastic menu that this diner has. From classic breakfasts to delicious dinner options, there's nothing here that you won't love. If you haven't seen their restaurant menu, then you're missing out. Stop in to Rolly's Diner today and place your order. OMG! What a FABULOUS meal we had at Rolly's. My husband and I were celebrating our anniversary, and wanted a special lunch on our day off. I had the breakfast skilled, and he had the steak sandwich. So much wonderful food and friendly banter at the counter made for the perfect day out for us in Lewiston, ME. Thank you Rolly's Diner!! Went here for breakfast and it was great. When we first walked in it was a little scary but the place was packed so I figured that was a good sign. Breakfast was wonderful and I had "the award winning chili omelet" as suggested by our very friendly waitress. It sounds icky but it is wonderful! Very friendly service and great food. Glad I went. The restaurant menu will leave anybody's preference satisfied. "Great breakfast and lunch diner...great food more"
"Excellent place for authentic Franco-American cuisine"
Catering, Fruit Sculpture, Breakfast, Dinners, Sandwiches, Big Breakfast, Big Steak Breakfast, Eggo N Stuff, Loaded Omelet, S.O.S., Rolly's Own Recipe Breakfast, Sandwiches, Lemon Pucker Crepes, Pancakes, French Toast.